Generally, when an airline cancels a flight, travelers feel frustrated. For Del and Suzanne Livingston, however, a canceled flight in Mexico led them to a new calling. The nonprofit they helped establish – Friendly Waters for the World – operates primarily in Africa, bringing clean drinking water to over 40,000 people, along with much-needed jobs and money for families to pay school fees. In 2005, Del and Suzanne were vacationing in Mazatlan, Mexico, when they met Rod and Ingrid McCarroll from Calgary, Canada. The McCarrolls were in Mazatlan with the Vineyard Church, demonstrating community benefit projects, including simple BioSand water filters, which can be produced in a village with just a few outside materials. The filters screen out impurities from dirty river and lake water. The Livingstons spent a day learning how to make the filters with the McCarrolls. However, before the Livingstons could be certified to produce the filters themselves, they needed another day of training – a problem because they were scheduled to fly out the following morning. Enter an airline mix-up; and, perhaps, divine intervention. The Livingstons were waylaid in Mexico, giving them time to be certified, and led to the BioSand Water Filter Project (BWFP), established by Del and Suzanne in 2007. BWFP was the precursor to Friendly Waters, incorporated in 2010. The possibilities that the Livingstons saw in the production of water filters tell a story about openness, friendliness, and simplicity. These are core tenets of Friendly Waters, which the Livingstons co-founded with David Albert of Olympia Friends Meeting (friendlywater.net.). These tenets also describe the Livingstons themselves, and resound in their Quaker faith. The BioSand water filter looks like a small podium made of concrete. It was developed by Dr. David Manz, a professor at the University of Calgary, and is available for use worldwide through an open source patent. BioSand filters are distributed by many international NGOs, including Oxfam, Samaritan's Purse, World Vision, and The Ronnie Fund. Since that fortuitous 2005 training in Mexico, Friendly Waters has transformed countless African villages and towns in eight different countries. "People don't remember the numbers, but they do remember the stories," says Del. And the stories are many. Del recounts that when Friendly Waters first started working with a Pygmy group in the forests of the Democratic Republic of Congo – a people known as the Twa or Batwa – they learned about how astonishing their visit seemed to the local people. A young Twa man named Elifaz was assisting them. As Del puts it, "An old, old elder told Elifaz, 'No one has ever been in to help us from the beginning of time, and here you bring us clean water.'" 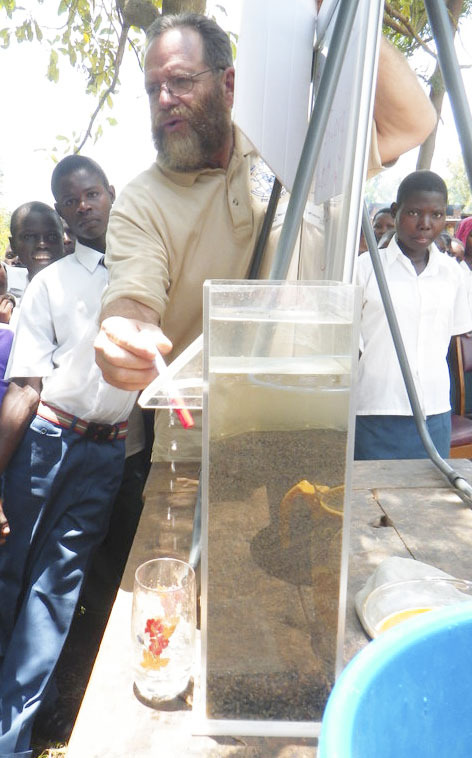 David Albert, chairman of the Friendly Waters board, described why clean water is so important to those who don't have it: "I can quote back all the statistics about bad water – the number of children it kills, the number of lives wasted.” He explained further that one of the worst effects of dirty water is people’s inability to plan for a better life. “When three out of six of their children might die . . . they can't think straight." Though most people in the West realize that AIDS is a huge problem in Africa, not as many are aware of the connection between AIDS and bad drinking water. "If your body is not fighting all of the effects of bad water, your body is going to be stronger," says Del. " . . . . [You only] get about 20% of the effect of the antiviral meds when your body is fighting waterborne contamination – bacteria and viruses." Del and Suzanne generally spend half the year working in Africa for Friendly Waters. From April through June, 2014, they will be working on the shores of Lake Victoria with the Kalal Community Self-Help group and the Kenya Ministry of Health. Describing the area and the culture, Del said, "There are rice patties all over the place, clear out to the horizon. . . This area had been a very successful farming area until the effects of AIDS took over the community. So many of the adults have passed due to it, and there are quite a few families with children raising children." Not only is 30% of the population there HIV-positive, but the people commonly suffer from diarrhea, typhoid, and worms; primarily from the water they drink, which comes from Lake Victoria, says Del. Not only will Friendly Waters bring clean water to Kalal, it will bring much more. As Suzanne explains, "When we first started, we were just thinking in terms of clean water, but we found that other things were important, such as jobs . . ." Hence, even though it would only cost Westerners $50 each to donate water filters to Kalal, Friendly Waters believes it is more important to teach villagers to set up their own small businesses to make the filters themselves. So far, Friendly Waters has helped to set up more than a dozen such businesses. Del noted that several NGOs simply ship plastic BioSand filters overseas in container lots; but, he said, "Our method is slow and methodical, and the fact that we produce jobs whenever we set up a facility to manufacture filters [is important.] Just a few jobs make a great deal of difference." "Friendly Waters doesn't only go to the poorest countries; we go to the poorest people in the poorest countries," says Albert. "If they can make $3- $5 per day," adds Del, “they've got the money to pay for food and their school fees. . . So just a few shillings or dollars can make all the difference in the world as to whether a child is going to be able to go to school and qualify for the testing exams at the end of the year." Karen Fleur Tofti-Tufarelli is a freelance journalist and grant writer As a journalist, she has covered a wide range of topics: NGOs working in Africa; the environment and natural disasters; the arts, travel, natural living and food. She can be reached at fotojourno-AT-live.com.